Some version of gumbo is always on the menu at any given restaurant in New Orleans. This classic seafood version, which is chock-full chicken, Jonah crab claws and vegetables swimming in a broth richly flavored, is always a hit with a crowd. You can also make it the centerpiece of a Mardi Gras meal. Heat a large cast iron skillet over medium high heat. Add the oil allowing it to heat for about 5 minutes until it begins to shimmer, then add the flour to the skillet. With a wooden spoon, stir the oil and flour together to form a roux. Lower the heat to medium low and continue to stir the roux for 15 to 20 minutes, or until the color of dark chocolate. Add the onions, bell peppers, and celery to the roux and stir to blend. Stir the vegetables for 5 minutes, then add the garlic. Cook the garlic for 30 seconds before adding the the stock to the pot. Heat an 8-quart stockpot over medium heat, add the roux to the pot and season with with the thyme, bay leaves, salt,pepper, and file powder. Add the chicken stock. Add the chicken. Bring the gumbo to a boil and lower the heat to a simmer. Continue to simmer the gumbo for 1 hour, skimming the foam and any oil that rises to the surface. Season the catfish with creole seasoning. Stir in the crab legs and the catfish into the gumbo and cook for 10 minutes. Add the okra to the pot and cook, stirring often, for an additional 5 minutes. Taste the gumbo and season with salt and black pepper, if necessary. Remove the bay leaves and chicken bones and discard. To serve, garnish with the parsley and green onions and serve in shallow bowls over white rice. It’s Mardi Gras, and down in New Orleans, the King Cakes, beignets and other gustatory delights are flowing freely. But if you prefer your culinary temptations with a side of history, allow me to introduce you to the calas, a Creole rice fritter with a storied past. Never heard of a calas? Most people outside of New Orleans never heard of them either. It’s basically a rice fritter. Calas are just one of the many rice dishes that actually made the journey during the Middle Passage across the Atlantic Ocean. Calas are made of leftover rice mixed into a sugary egg batter, then deep fried and served dusted with confectioner’s sugar. To me, they are kind of like beignets, only better — with a more interesting backstory. Calas were once a vital part of African-American livelihood in the New Orleans, and even helped some slaves there buy their freedom. The cala became a very important part of New Orleans’ history. Scholars think slaves from the rice-growing regions of Africa who were brought to the Carolinas specifically to grow rice. And as slavery spread down to the Gulf Coast, calas were eventually brought to Louisiana. Some culinary historians can trace calas to Ghana, others, to Liberia and Sierra Leone. If you were to go to Africa today, to Ghana or Liberia, you would find the women in the open-air markets making calas. In 1685, during the days of French rule, New Orleans was ruled by the Le Code Noir or the “Black Codes”, a decree originally passed by France’s King Louis XIV. The Code Noir defined the conditions of slavery in the French colonial empire, restricted the activities of free Negroes, also known as free people of color, and forbade the exercise of any religion other than Roman Catholicism, and expelled all Jews from France’s colonies. The code has been described by Tyler Stovall as “one of the most extensive official documents on race, slavery, and freedom ever drawn up in Europe”. The Code Noir resulted in a far higher percentage of blacks being free people of color during this period where the free color populations was 13.2% in Louisiana compared to 0.8% in Mississippi. In by 21st Century standards, they were on average exceptionally literate and highly educated, sending their children abroad to study in some of Europe’s finest universities at the time. Many were were doctors and lawyers, with a significant number of them owning businesses, properties and even slaves. Today, most people are unaware that the free people of color were highly successful in the era of slavery. It was a very different climate in New Orleans than in the rest of the United States at the time. When the Spanish took control of Louisiana in the 1760s, they brought with them a powerful legal instrument, coartacion ,a specific type of manumission that pertained to slavery in the Hispanic Caribbean, through which slaves were allowed to purchase their freedom on a gradual basis. They were considered ‘free’ in exchange for compensation for the slave owner. In other words, coartacion gave slaves the right to buy their freedom. For enslaved black women in the city, selling calas was a key way to earn money for these purchases. These women were able to buy freedom for their families and for themselves. More than 1,400 New Orleans slaves bought their freedom under Spanish rule. But it’s not clear just how many did so with calas money. African-American culinary historian Jessica B. Harris has noted in her writings that not all calas vendors were enslaved. And the ones who were slaves often sold them for their mistresses. If they were lucky, they were allowed to keep a portion of the money, or perhaps have it go towards their freedom. Americans ended the practice of coartacion soon after the 1803 Louisiana Purchase. But New Orleans remained home to thousands of free blacks – and throughout the 1800s, many of them, especially women, made their living selling calas and other street foods. But indoors, calas “remained popular as a home treat” among African-Americans — especially during Mardi. Friends and neighbors prepared calas for their families and for the maskers who stopped by for a little ‘recess’ from their parading. And the fritters did survive in at least one public eating space: The Old Coffeepot Restaurant, a French Quarter breakfast joint, where they’ve been on the menu for decades. 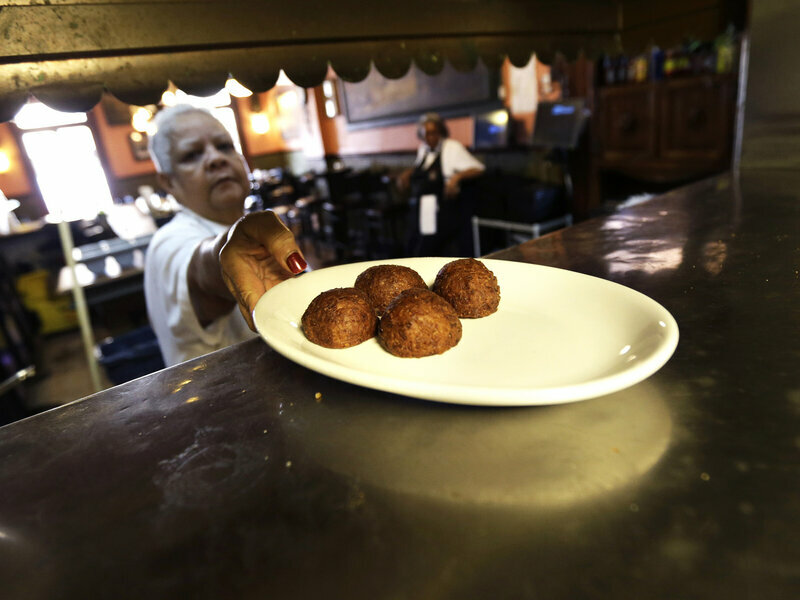 Waitress Gaynell James Serves up calas from the kitchen at The Old Coffeepot Restaurant in the French Quarter. Gerald Herbert/AP 2013. After chef Frank Brigsten purchased Charlie’s in 2009, he replaced hushpuppies on the menu at the longtime neighborhood seafood joint —a fixture in Harahan, outside New Orleans, since the 1950s—with a savory take on calas. They have gotten to be so popular that the restaurant now serve shrimp calas as an appetizer. In recent years, calas have also made their way into a higher-profile tradition as well. In 1990, New Orleans’ Haydel’s Bakery revived the old tradition of including miniature porcelain dolls in their Mardi Gras King Cakes. The Original 1990 Frozen Charlotte Doll quickly became a collector’s item. Since then, Haydel’s has choosen a different porcelain figure that celebrates one of the traditions of the city’s beloved Mardi Gras heritage and bakes them into their famous King Cakes. In 2010, that figurine was in the shape of the iconic calas lady, her basket of “belle calas” balanced on her head —not forgotten. a symbol of a New Orleans long gone but, but still alive in the hearts of many. And so the cala, a rice dish that is a part of New Orleans’ history, will be saved for future generations to come with this recipe that is presented below. Mix the rice with flour, sugar, baking powder and salt. Add the vanilla and mix well. Add eggs and when thoroughly mixed, drop by tablespoonfuls into the hot oil , heated to 360 ° F. Fry until browned on both sides. Using a spyder, remove the fritters from the oil and drain on baking sheet lined with paper towels. Sprinkle with powdered sugar. Serve hot with coffee or Cafe au Lait.